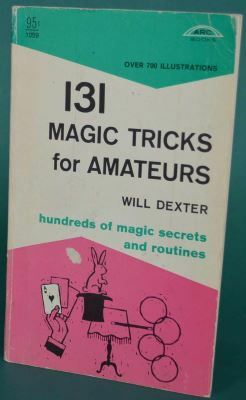 Comments (Andrew Pinard): This seems to be an updated version of Dexter's "The Illustrated Book of Magic Tricks" (1957, Abbey Library). This edition adds 14 additional tricks: The Power Of Money; Anti-Gravity Matches; Who Put That Stamp On The Ceiling; Money, Money, Who Has The Money? ; The Acrobatic Tie; A Tunnel Through A Playing Card; Through The Needle; Eyes In Your Fingertips! ; Pulse Stopping Mystery; Linking Paper Clips; Your Own Flying Saucer! ; Snakes Alive; Button, Button! ; And The Spooky Cigarette. 27 The Feast Of Candles! 29 Who Put That Stamp On The Ceiling? 30 Where Does The Money Go? 31 Who Has The Money? 32 Through The Fourth Dimension! 49 Out Of Thin Air! 58 X Marks The Spot! 66 The Marvellous Stripper Pack! 69 The World's Longest Trick! 70 "And I Shuffled The Cards Myself!" 77 The Card With Four Sides! 80 The Romans Had A Word For It! 89 A Trick With Polo—the Mint With The Hole! 90 Almost The Indian Rope Trick! 95 This Reef Knot Is A Slip-Knot! 96 The Knot That's Not! 98 The Great Sack Escape! 105 The Number You Want! 114 Ears At Your Finger Tips! 118 Eyes In Your Fingertips! 125 Your Own Flying Saucer! 126 Can You Believe Your Eyes?